Cooke Aquaculture, a global seafood company, relies on science and experts to ensure sustainability, while relying on iMaint for the maintenance of their marine assets. Tracking assets is one complex part of their marine maintenance needs. Read on to learn more about the Cooke Aquaculture success story. Opening a package of seafood directly from the grocery store may make your mouth water in anticipation of the meal ahead. 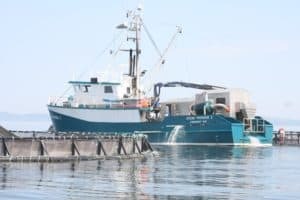 However, producing the best farm-raised salmon, wildcaught salmon, scallops, crab, oysters and shrimp is a highly technical process that begins many months earlier. 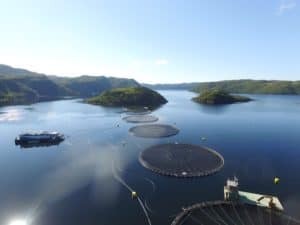 Cooke Aquaculture, founded in 1985 by the Cooke family with one farm and 5,000 salmon, has grown into an innovative and fully-integrated global seafood company. They rely on science and the knowledge of experts to ensure pristine marine environments and sustainability for their products and resources. They entrust their assets to iMaint for tracking maintenance and labor, ensuring that vessels, nets and cages are all ready to go on schedule. Troy MacNeill, Database Administrator for Cooke, is based at a facility in St. George, New Brunswick, Canada that includes a net shop and marine maintenance. “Cooke is global and has thousands of employees. We currently use iMaint in Newfoundland and Labrador, New Brunswick, Nova Scotia, Maine and Washington. I hope that we can add our plants in Scotland, Chile and Spain to our iMaint system in the near future,” MacNeill says, explaining the scope and reach of iMaint. “We use iMaint to track marine maintenance for about 600 different vessels or equipment at various sites. In addition to our vessels, we track 100% of labor in iMaint and report on it daily,” explains MacNeill. Marine maintenance includes vessels, nets and cages. In the net shop, nets are tagged as assets. iMaint is used to track all repairs on each net including 100% of the labor hours used, where each net is shipped to and installed, how long each net is in the water, net wash costs (comparing the weight when dirty and the weight once it has been cleaned), and when a net is returned to the shop for repair. Sometimes nets are washed on the water and iMaint tracks how many times a net is washed, who washed it and the proper net washing program used to keep fish healthy. If a net is repaired, it has to pass a break test and the results are stored in iMaint for auditing purposes. One way that MacNeill made the data useful was to change labels on the main tab in the Asset and Work Order modules so that the secondary tab could be completely deleted. Customizing iMaint for their specific needs made it clear where data is stored. Making the fields required also ensured consistency in data entry. His plan is to move from reactive maintenance to preventive maintenance this year. “Moving to PMs this year is a tall order, but with the data iMaint provides, I know we can do it. We’ll start with the simple things like oil changes,” says MacNeill. Cooke has both the iMaint Requesters and iMaint Mobile optional modules. When work needs to be done on vessels, equipment or nets, each user has an iPad or iPhone and submits a work request. This work request needs to include data such as engine hours and current location. A work order is then created in iMaint for the work that needs to be done. “We use the project module in iMaint for tracking vessels and utilize procedures to analyze estimated versus actual costs for work orders. Using the project module helps with costing. Any maintenance job might have multiple work orders associated with the project ID as well as multiple procedure lines, including comments and miscellaneous costs. The project module allows me to break down procedure lines by estimated versus actual costs” says MacNeill. All cages for fish that are in the water are built from scratch. Using custom procedures and comparing estimated hours and parts to actuals, MacNeill knows from a production standpoint how much time and resources it takes to create a cage. Since all cages are also tagged like the nets, MacNeill also knows how many hours each cage is used and when it should be retired based on usage, wear and repair. Comparing the cage life span to the cage construction costs, MacNeill relies on information stored within iMaint to help him plan for the year ahead. Since vessel downtime would impact their ability to provide fresh seafood, Cooke has a large stock room for parts. 100% of maintenance time is tracked within iMaint and reported on a daily basis. “Over time, this gives us a better feel for how long repairs take and how much of an investment repairs are. Tracking this data provides us a lens on asset management, allowing us to make more informed decisions on whether to repair or retire a vessel,” explains MacNeill Maintenance hours, vessel information, net and cage information– it’s all tracked through custom reporting. These reports are automatically generated and sent to a list of recipients, which can be added or removed at any time as needs change. Automated custom reports provide Cooke with pertinent data needed for up-to-date business analysis, ensuring they remain on top of their maintenance management needs as an innovative seafood company.